My name is Mathew Done and I’ve worked in the food and drink industry for over 20 years, specializing in the Catering Sector promoting brands and creating new products. For 13 of them I’ve worked in the NHS on Special Diets and for 11 of those I’ve focused on the field of dysphagia. Dysphagia is the medical term for swallowing difficulties. It affects the epiglottis, the flap of skin at the top of lungs/stomach. It doesn’t work properly and so ordinary foods like you and I have flow to fast for it to cope with. Consequently they go into the lungs instead of the stomach and induce choking. If not managed the person can develop aspiration pneumonia, become dehydrated and ultimately die. To prevent these complications they need their meals pureed to a specific consistency and so I helped develop a range of high calorie meals that looked good, tasted good and did those with dysphagia good. After leaving the hospital I Googled thickened drinks and discovered tins of thickener were the product of choice. These contain a modified maize starch which you spooned into a drink to thicken it up. This format had been used for over 15 years with no developments and several brands promoting the same thing. That suggested to me most were happy with it. Wrong! When thickener from tins is added to a drink, it doesn’t work straight away and so carers tend to add more. They then pass to the drinker a drink that looks like grey wallpaper paste. It can turn the taste of a drink sour. The thickener may not have dissolved and will need sieving through teeth and leave a gritty sticky residue on their teeth. I couldn’t believe in the 21st century those with dysphagia have to put up with drinks like this. They should still be able to have something enjoyable to drink – despite their condition! That started a 5 months research project into what drinks were being served and how they could be improved. I saw patients given drinks too thick or too thin for their swallowing ability. Some drinks separated within minutes. Some got thicker. Drinks stirred with the end of a pen and passed to patients with iceberg-sized un-dissolved pieces of thickener floating on the top of them. The final straw was seeing someone making a thickened drink and getting more thickener around the cup than it. It was like a snow scene from Narnia! Despite that, I carried on and spoke to as many people as I could, taking on opinions and useful suggestions, making improvements as I went. This carried on for months. Until thousands of miles, plenty of late nights, early mornings and weekends – success. In 18 months I’d managed to create a drink that tasted good and was safe to swallow. Provided in a cup with a drink flavouring and a quantity of our unique tasteless, quick dissolving thickener, carers only had to add water to make a pleasant drink that was safer to swallow. I presented Slõ Drinks to Manchester Royal Infirmary on a Wednesday afternoon and no changes were asked for! The following day presented them to the Royal Liverpool and the same response. Shortly after I received an order and both Hospitals started to use them. That led to another trial – putting Slõ Drinks on prescription. Uniquely Great Britain’s National Health Service has something called Continuity of Care, if you have something in Hospital it should be available to you after discharge on prescription. That means making a prescription application to NICE the UK’s prescription approving authority. It took 9 months to prepare the application. The Slõ Cold Juice drinks were approved. Unfortunately, the hot drinks were not and so I spent the next 18 months collating the extra evidence to prove their case. Slõ Hot Chocolate, Slõ White Coffee and Slõ White Tea are now available on prescription. Our Slõ Drinks in cups have now been joined by a new range of drinks – Slõ Drinks from sachets. These like our original drinks came from a conversation. But this one didn’t start well. At a meeting in a hospital that will remain nameless, one of the clinicians was laughing about Slõw Gin and I thought she was doing it at our expense. I was assured she wasn’t. Those with dysphagia still like alcohol but existing thickeners don’t mix with well with it. Despite this those with dysphagia try to thicken alcohol and are known to take tins of thickener to a pub! I didn’t intend to do anything about this. We only focused on providing drinks for health care – not for fun. It was only after hearing about an elderly lady that wanted to take wine at Communion and couldn’t because she had dysphagia we decided to try and help. We sourced a tasteless, quick dissolving thickener that works with wine and put a dose of it into a sachet for one 175ml glass. It just needs adding to the wine, to make it safer to swallow. 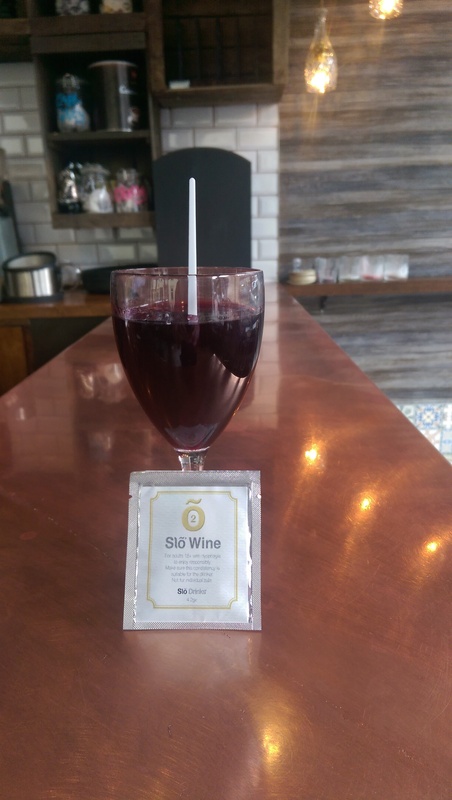 As a result red, white or rosé wines can now be changed into Slõ Wine. By accident we discovered the same thickener works with fizzy drinks and so children can change their favourite fizzy drinks into: Slõ Cola, Slõ 7UP, Slõ Irn Bru etc. These look amazing as the bubbles are trapped in the drink. On a hunch we tried it in alcoholic drinks with bubbles and it worked just as well. Slõ Lager, Slõ Beer, Slõ Bubbly and Slõ Mixer for use with Gin & Tonic etc. You can imagine how satisfying it is to hear people like it; that someone’s Mum has been able to enjoy a glass of wine for the first time in 8 months or their Dad a beer and the pleasure it gives them. This led to our latest development, the Slõ Medicinal range. Oral ingestion of medication is seen to be more convenient; have higher compliance, safety, efficiency, ease of accessibility and low cost – unless a person has dysphagia. This requires the preparation of liquid medications which are expensive, take time to produce and will not necessarily be safe to swallow for the patient. Our thickener is changing that. Slõ Soluble mixes soluble pain relief, medication and vitamins. The dose is only enough to mix with 100ml of water; the smallest volume that can be safely changed to a specific consistency. Slõ Solulax changes the consistency of soluble laxatives and is the only one which works with them. Slõ Cold & Flu mixes with hot – cold & flu relief such as Lemsip and Beechams. That brings us to September 2014. Every drink that someone with dysphagia needs can now be changed into a Slõ Drink. Whoever makes them, Slõ Drinks will match the consistency prescribed and can be drunk without worry. Until recently Slõ Drinks were only sold in the UK. However, dysphagia is a worldwide condition. 56 million people are suffering with it today. We are now receiving enquires from Clinicians, carers and patients from Australia, Canada and on the 8th of September 2014 we sold our first sachets in America. Consequently, although it’s going to take some time – we are working hard to make Slõ Drinks sachets available in all these countries. Who would have thought all this from a simple question!